Are you asking Jesus the right question? Did you know that there are over 3.5 billion searches on Google every single day?! We all want to know stuff and we all know that Google has the answers. But what about the questions that Google can’t answer? The ones that are deep inside us. The ones that threaten to shake our foundation and rob us of our joy. The questions we are afraid to ask. Why am I still in pain? How can I be used in this situation? How is it possible that you love me this much? How do I best share with others the amazing things you are teaching me? How can I be a part of the solution to this broken world? How can I be most effective while I sill am here? His “how” changed to a “why” when he took his eyes off Jesus. 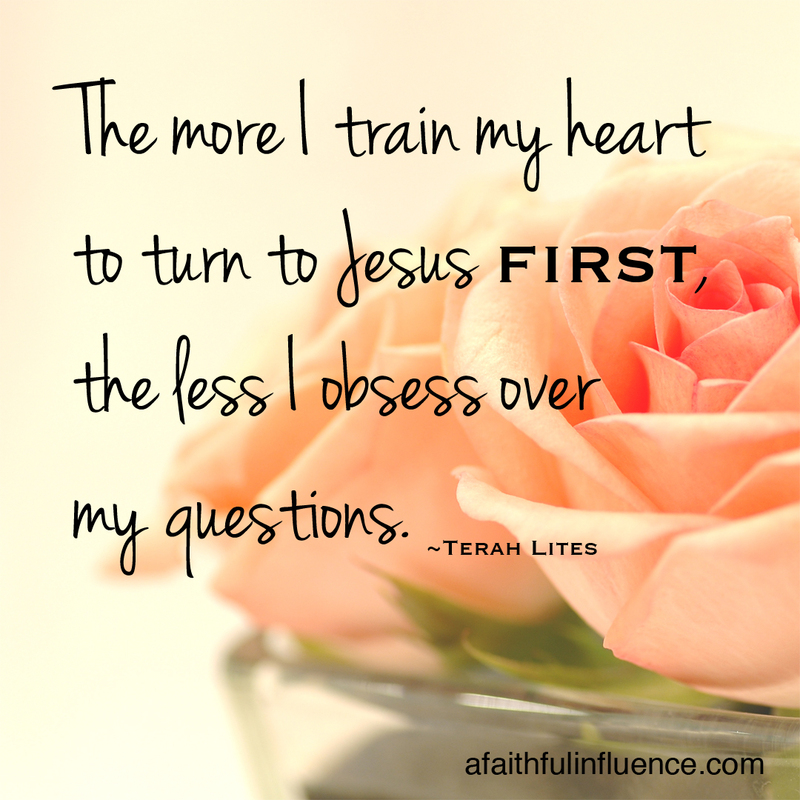 The more I train my heart to turn to Jesus first, the less I obsess over my questions. My focus is brought back in to a place where everything makes sense again. Where my thoughts line up with my heart, because it is seeking after His heart. Perspective is found and peace is the result. What questions are swirling around in your heart and mind? This week, bring them to Jesus and watch Him transform them before your very eyes. See how He takes your “whys” and turns them into beautiful “hows” that bring you contentment instead of anxiety. I would love to see us share our questions with each other. Comment below with your “question testimonies” and let’s be encouraged as we see that we are not alone with our questions of desperation, but together we can watch them be turned into questions of confidence and hope. This week let’s surrender our questions, let it encourage our hearts, and cause our minds to become still. Just today I experienced this very thing. I have been literally obsessing this last month, to the point of making myself sick, over the very serious struggle of a friend. During this time God has miraculously turned her situation around. Instead of rejoicing with her I have been making myself sick with worry over ME! Today as I was praying God spoke to me and said, “Lisa, you are making this all about you! Rejoice over what I have done for HER! Glorify ME just like she is doing.” I can say that Jesus truly transformed my perspective and peace settled in. (The supernatural peace that passes all understanding!) I’m so thankful for His patience with me. Lisa, I love your honesty! I have done that so many times…worried about someone else’s struggle when all along God has been working, they have been moving out of it, and I’m still stuck in the beginning because it was not my burden to carry. I heard a great analogy once that you get your boarding pass when you are about to board the plane, not months or weeks before. God’s grace is the same way. It is very specific to each person and what they need at the time. Those of us outside their struggle looking in don’t get the same kind of grace. Our job is to let God be God and know our role as a friend and as a prayer warrior. When we take it all to God the burden disappears and it is replaced with peace! Thanks for sharing your heart with us. I pray God continues to show you how to release your worries to Him.